Why has drug prohibition had so many negative effects on communities and human rights? What changes are needed? openDemocracy and the Center for Legal and Social Studies (CELS) introduce a new partnership. Anti-drugs operation, Ayacucho, Peru. Credit: Alberto Cifuentes. All rights reserved.The international drug control system has caused much greater damage than the substances it targets. Gross human rights violations have been committed in its name. And after five decades of harsh legal enforcement, criminalisation and militarisation (largely outside the consumption centres of Europe and north America), it has failed to reduce the drug trade. In the articles, videos and personal stories we are publishing, we look at the consequences of this punitive approach in different parts of the world, the myths involved, the gender and race implications, security structures and economic links. We also begin to explore alternative policies. This six-month partnership is timed to coincide with the United Nations General Assembly Special Session on the world drug problem (UNGASS), which takes place in April. UNGASS is an opportunity for stepping up this debate on global drug policy, and human rights should be put centre stage. Before and after UNGASS, we aim to contribute to the discussion with empirical data and personal accounts. What follows is a 'day-by-day' guide to our first openDemocracy guest week on “the human cost of global drug policy”, held from 14 to 18 March 2016, which set out the main themes behind this editorial partnership. We kicked off the week with an overview of the ‘Pandora’s box’ that is drug policy, written by Luciana Pol, a CELS senior fellow. Prohibition has spawned militarised responses in Latin America, state collusion, prison overcrowding, torture and killing – and it has been used to control and discipline already marginalised social sectors. Find out why reform is being advocated by everyone from human rights organizations and feminist groups to peasant leaders and prominent scholars. Julia Buxton, a professor at the Central European University, addresses the history and failures of the international drug control system. She outlines the realities of global drug markets, exposing fallacies about the substances themselves and highlighting gross south-north inequalities in the costs and impacts of the fight against drugs. “9 things we’ve learned from a 50-year war on drugs” is openDemocracy's breakdown of the ways in which the drug prohibition model is both damaging to human rights and ineffective. It draws from a joint report by 17 organisations from 11 countries, spanning south, central and north America. The myth of a drug-free world: Carl Hart, a Columbia University professor, talks on video about the sensationalism around drug use, who benefits from these exaggerations and misrepresentations, and how drug policy is used to persecute men of colour in the United States. He also touches on the Black Lives Matter movement, reform options, and the cracks in the dopamine theory of addiction. More and more women are being incarcerated for low-level drug offences, and in Latin America the vast majority of them are single mothers. This has broad ramifications for families and society, and these women’s already-poor economic prospects are worsened by the stigma of having a criminal record. Possible policy solutions are explored by Coletta Youngers of the Washington Office on Latin America (WOLA) and Nischa Pieris, a gender specialist working for the Organisation of American States (OAS). “Believe me, when you’re alone with your three children … you can’t say, ‘Sorry, I can’t feed you. I don’t have work.’” Johana, a single mother incarcerated for a drug-related offence in Colombia, tells her story in a photo essay. In the United States, the federal prison population ballooned by 790% over the last two decades. And today 60% of the people in US prisons are racial and ethnic minorities. Ezekiel Edwards of the American Civil Liberties Union shows how this “massive criminal punishment system” is riddled with racial injustice, from policing and stop-and-frisk tactics to consistently harsher sentencing. The country’s Black community suffers the brunt of this. A growing number of countries are shifting away from punitive approaches that criminalise people who use drugs. This is because of the harm done in terms of mass incarceration, human rights abuses and the spread of blood-borne viruses, among other problems. A new report by Release shows that decriminalisation does not lead to increased drug use, but can lead to financial savings for criminal justice systems and better public health outcomes, according to Niamh Eastwood and Edward Fox. What is the UNGASS and why does it matter? The United Nations General Assembly Special Session on drugs, set for April, could help change the course of the international drug control system, basing it on principles of harm reduction, public health and human rights. But despite shifting positions, even within the historically hardline United States, resistance by some countries and some UN agencies themselves threatens to stymie any talk of reform, according to Ann Fordham of the International Drug Policy Consortium (IDPC) and Martin Jelsma of Transnational Institute (TNI). Meanwhile, nearly 200 civil society organisations express concerns over the preparatory negotiations in Vienna. Is capitalism fuelling the war on drugs? Author Dawn Paley explores how state policies purportedly aimed at fighting drug trafficking lead to violence, terror and displacement – and also benefit transnational corporations. She refers to the four Ps of the war on drugs: policy, police, paramilitaries and prisons, and explains how business and economic motivations drive these damaging strategies. British writer Johann Hari speaks on video about how he began rethinking drug addiction. He reflects on the hounding of Billie Holiday by the US Federal Bureau of Narcotics, the heavy toll that the ‘war on drugs’ takes on some groups, and looks to the US liberalisation of drug policy, and prospects at UNGASS. Remote warfare is being deployed in the ‘war on drugs’ in very similar ways to the US-led ‘war on terror’. This includes the use of mass surveillance, drones and the privatisation of security tasks. But concerns are growing about the transparency and accountability of these methods, as well as their human cost and long-term effectiveness. Esther Kersley of the Remote Control project says that instead of deploying new tactics, governments must address the root causes of insecurity. By every measure, US counter-narcotics operations in Afghanistan over the last 15 years have been a total failure, writes Julien Mercille, a lecturer at University College Dublin. Meanwhile, drug use treatment and prevention received little support. This is because tackling the drug problem is not a priority for Washington, which instead has backed drug traffickers and power brokers in its fight against the Taliban. While some Latin American countries are pushing for change in drug policy, most Middle Eastern countries remain firmly in favour of the punitive approach. Philip Robins, a reader at the University of Oxford, analyses drug-related strategies and offences in Middle Eastern countries and tracks heroin and its opiate derivatives produced in Afghanistan through Iran and Turkey, to Europe. Clara Gómez González and her 15-year-old daughter, Erika, were being held by presumed members of a criminal gang in a warehouse in central Mexico when the military burst in. In what became known as the Tlatlaya massacre, 22 people were killed – including Erika. Clara was the first person to speak out about what really happened that night, which the official version had chalked up to ‘clashes’ with drug traffickers. She tells her story here. Argentina’s new government has declared a national security emergency to fight drug trafficking, aligning itself with the region’s hardliners and the US-backed doctrine of ‘new threats’ to security. This could erode the crucial distinction between military and public safety tasks established after the last dictatorship. Poor oversight and erratic policies in recent years have fostered more state collusion with traffickers and worsened violence in poor neighbourhoods, write Manuel Tufró and Paula Litvachky of CELS. “The war kills more than the drugs.” A public awareness campaign in Brazil gets censored, giving it even greater reach. Julita Lemgruber, a specialist in Brazilian security policies, talks about the campaign on video and explains how her work on prisons and policing led her to the drug policy debate. 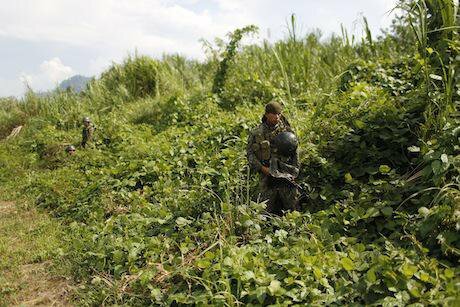 In places like Colombia, the prohibitionist approach to drugs has fostered the creation of highly profitable illegal markets, dominated by armed groups. Repressive policies end up harming society’s most vulnerable sectors, including drug users, indigenous peoples and small agricultural producers. Part of the problem lies with the UN drug control conventions, which must be harmonised with international human rights law, Carlos Juliano Simoes-Ferreira and Sergio Chaparro Hernández of Dejusticia write.